Channeling the popular comic convention experience, DC Artists' Alley brings unique, artistic viewpoints to the DC Universe through highly detailed, limited-edition designer vinyl figures that include prints featuring the original artwork the figure is based on. 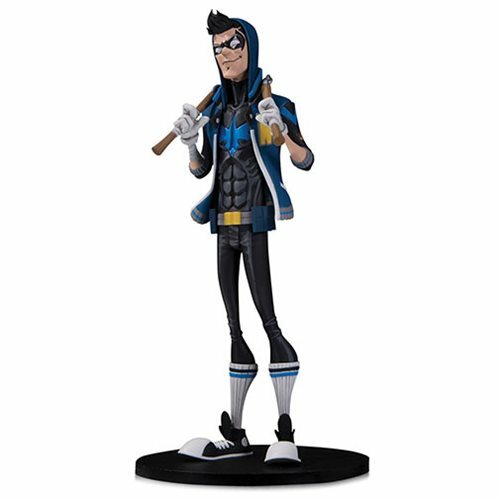 This DC Artists' Alley Nightwing by Hainanu Nooligan Vinyl Figure combines the classic iconography of the character with a streetwear fashion sensibility, classic high-top shoes, a flashy jacket, and comes Individually numbered. The statue measures slightly under 7 1/4-inches tall.